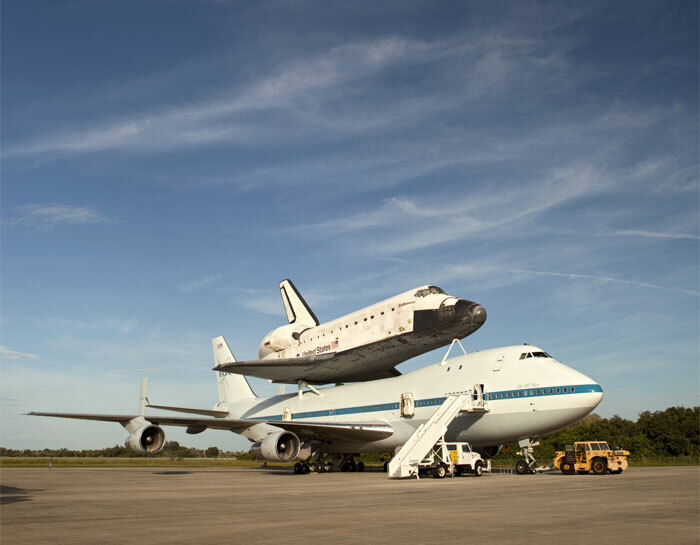 The Shuttle Carrier Aircraft, or SCA, has arrived at NASA’s Kennedy Space Center in Florida, just days before the jet carries space shuttle Endeavour on its final cross-country ferry flight. 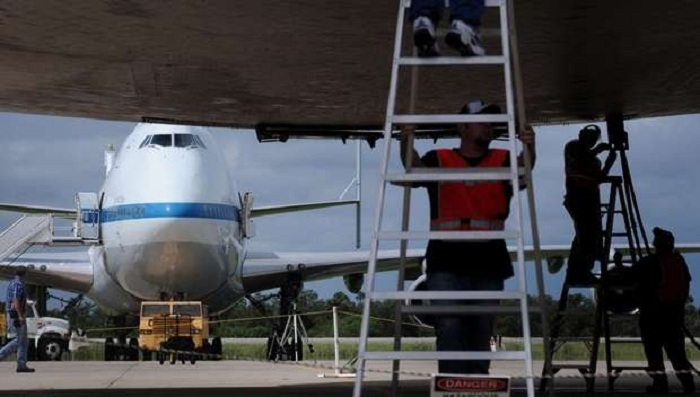 The modified 747 jumbo jet touched down on Kennedy’s Shuttle Landing Facility runway at about 5:05 p.m. EDT. 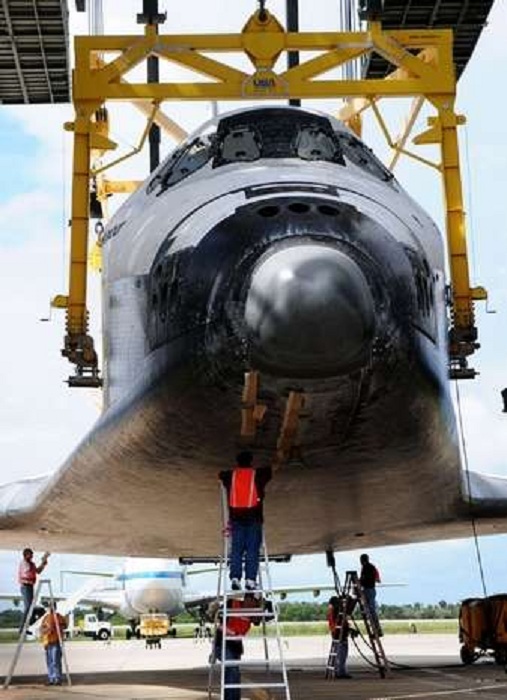 Early Friday, Endeavour will leave the Vehicle Assembly Building for the last time and move to the Shuttle Landing Facility mate/demate device, which will raise the spacecraft so technicians can attach it to the carrier aircraft. The duo will back out of the device Sunday morning. The pair is scheduled to take off at dawn on Monday, Sept. 17, beginning a multi-day journey scheduled to end Sept. 20 with arrival at Los Angeles International Airport. 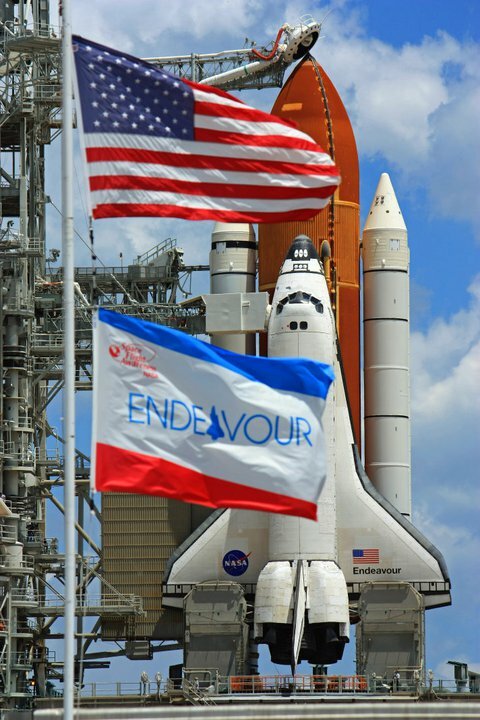 In October, Endeavour will move to the California Science Center, where it will begin a new career inspiring future explorers. EDWARDS AIR FORCE BASE, Calif. -- Space shuttle Endeavour, mounted atop NASA's modified 747 Shuttle Carrier Aircraft, will make the final ferry flight of the Space Shuttle Program era when it departs Monday, Sept. 17, from NASA's Kennedy Space Center in Florida headed to Los Angeles International Airport (LAX). 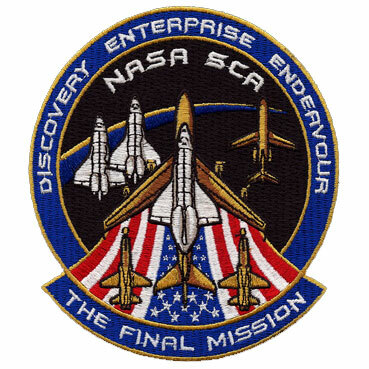 At sunrise on Sept. 17, the SCA and Endeavour will depart Kennedy's Shuttle Landing Facility and perform a flyover of various areas of the Space Coast, including Kennedy, the Kennedy Space Center Visitor Complex, Cape Canaveral Air Force Station and Patrick Air Force Base. The aircraft will fly west and conduct low flyovers of NASA's Stennis Space Center in Mississippi and the agency's Michoud Assembly Facility in New Orleans. As it arrives over the Texas Gulf Coast area, the SCA will perform low flyovers above various areas of Houston, Clear Lake and Galveston before landing at Ellington Field near NASA's Johnson Space Center. 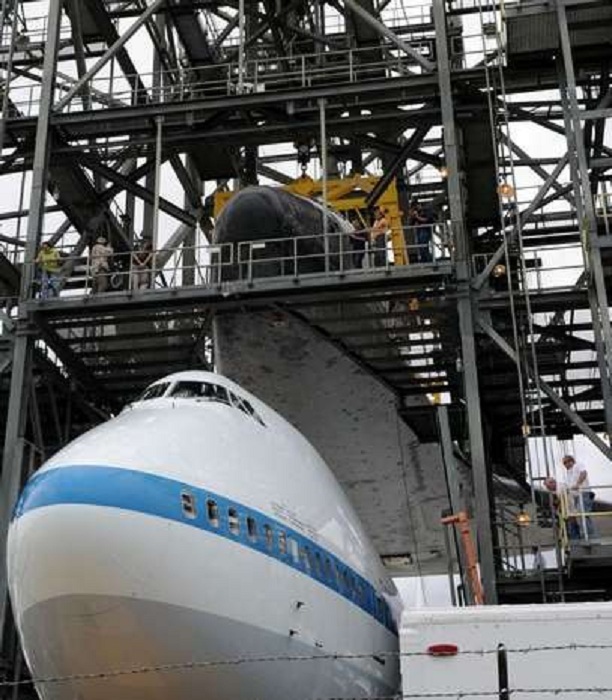 Weather permitting, the SCA and Endeavour will stay at Ellington the remainder of Sept. 17 and all day Sept. 18. At sunrise on Wednesday, Sept. 19, the aircraft will depart Houston, make a refueling stop at Biggs Army Airfield in El Paso, Texas, and conduct a low-level flyover of White Sands Test Facility near Las Cruces, N.M. before landing later in the day at NASA Dryden Flight Research Center. Early morning after sunrise on Sept. 20, the SCA and Endeavour will take off from Dryden. Flyovers are planned after departure over the nearby cities of Palmdale, Lancaster and Rosamond before the SCA-Endeavour combo head to Northern California for a loop around Sacramento, San Francisco and NASA's Ames Research Center at Moffett Field near San Jose before heading south for a final low-level flyover of several locations in the Los Angeles area before touchdown at LAX. The aircraft also will conduct a flyover of many Los Angeles sites before landing about 11 a.m. PDT at LAX. Beginning Oct. 30, the shuttle will be on display in the science center's Samuel Oschin Space Shuttle Endeavour Display Pavilion, embarking on its new mission to commemorate past achievements in space and educate and inspire future generations of explorers. 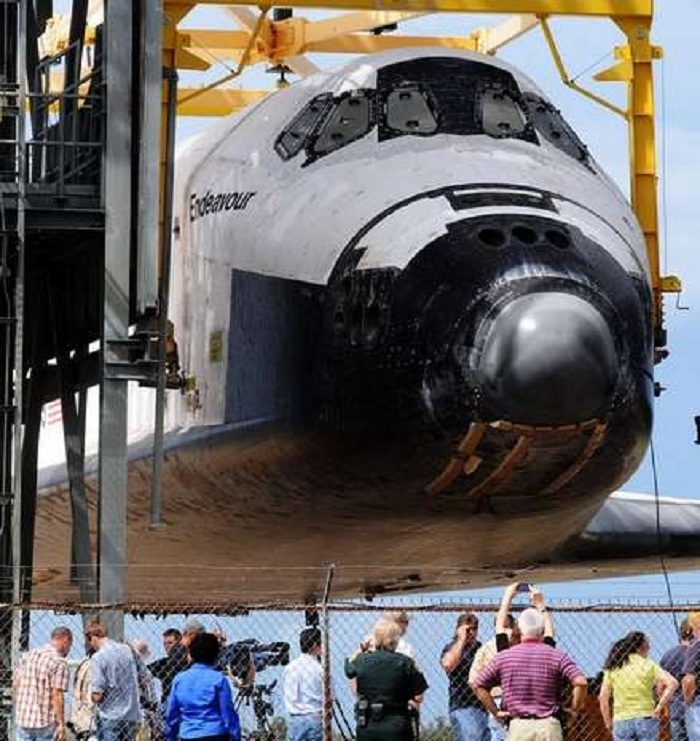 Space shuttle Endeavour is nearly ready to leave the Space Coast for its new home in Los Angeles. Kennedy Space Center crews today rolled the retired orbiter, a veteran of 25 missions, from the Vehicle Assembly Building to the shuttle runway. 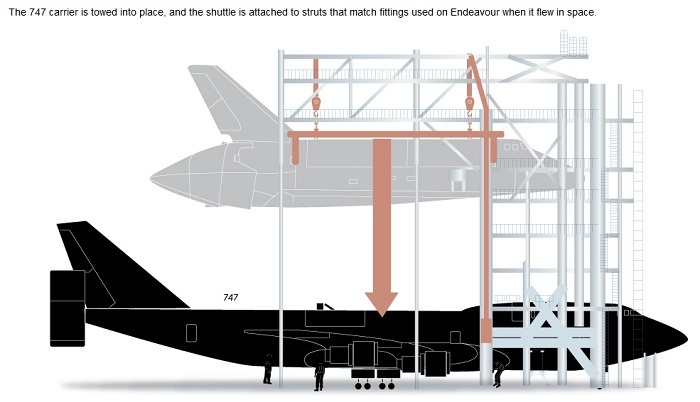 In a gantry called the "mate/demate device," cranes lifted the 155,461-pound orbiter high enough for a modified 747 carrier aircraft to roll underneath, then set Endeavour down on the plane. After a "soft mate" today, crews plan to finish bolting the orbiter to three attach points on Saturday. The 747 then will back out of the gantry Sunday morning. 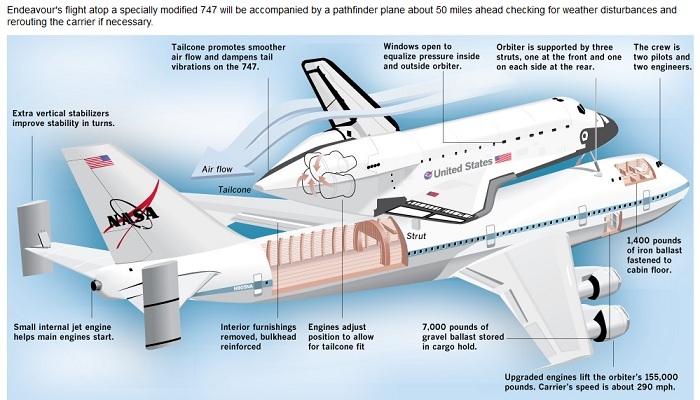 Weather permitting, it’s expected to take off with Endeavour at sunrise Monday, or around 7 a.m. The piggybacked jumbo jet and spaceship are expected to fly low over Cape Canaveral Air Force Station and the north beaches down to Patrick Air Force Base, swing across the Pineda Causeway and back up the Indian River Lagoon before a final farewell pass over the KSC Visitor Complex and Shuttle Landing Facility. 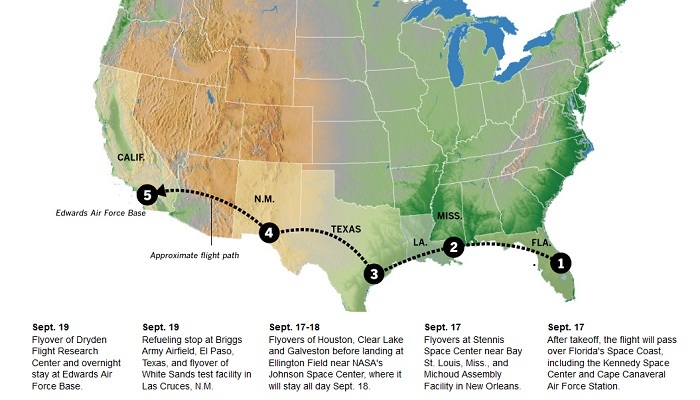 The cross-country ferry flight is the shuttle program’s last. 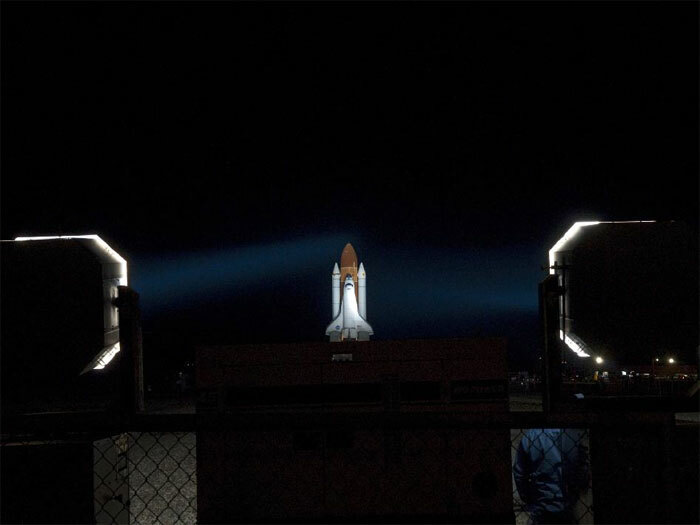 "I hope everybody takes advantage of it and steps outside wherever they are," said Stephanie Stilson, the NASA manager overseeing delivery of the orbiters to their display sites. "It’s the last time that we’ll get this opportunity in this area to do that." NASA plans a four-day journey to Los Angeles International Airport. 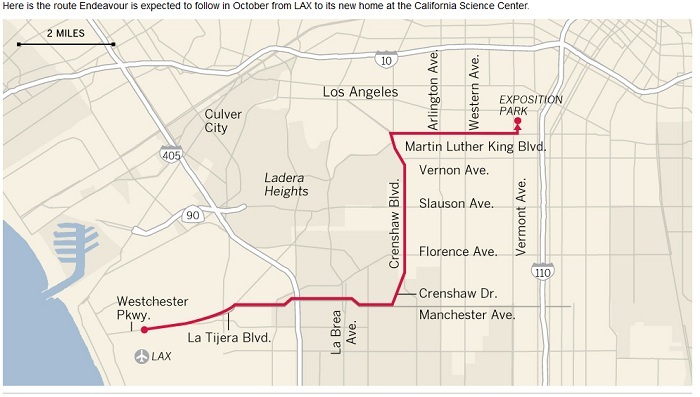 In October, Endeavour will roll 12 miles from LAX to its new home at the California Science Center, where it’s scheduled to open for public exhibit Oct. 30.